I have always been curious when my Filipino relatives discuss food, whether things they are making at home, or things to try when travelling to the Philippines. It seems like I have only skimmed the top when it comes to making Filipino food. The common ones are lechon kawali, bicol express, kare kare, arroz caldo, lechon manok, paksiw lechon, lumpia shanghai, and their famous adobo. The reality is that there is so much more, especially with their desserts which I have really yet to try. There have been several occasions when I have heard of a great breakfast, beyond a plate of garlic fried rice and tocino, and it inspired me because it is something similar to what I grew up eating when visiting my grandparents lake house, and that was fried fish with eggs. It was one of my favorites, and this one tops the list as well. 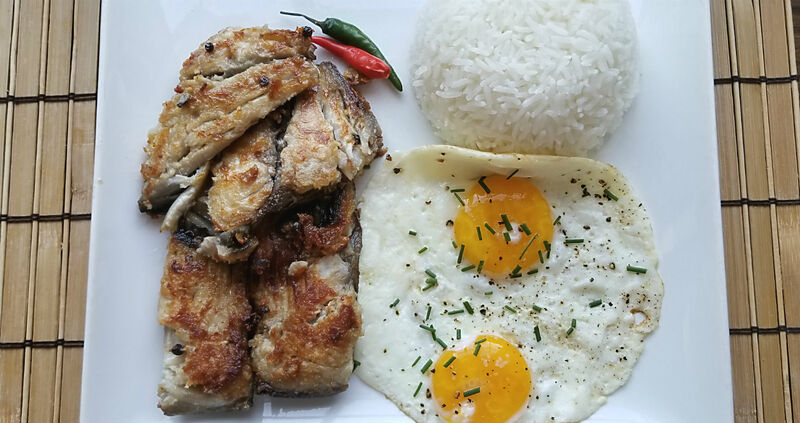 A Filipino fried bangus breakfast. The fish takes a bit of preparation but nothing out of the ordinary. A simple marinade, preferably overnight, along with the removal of any bones (you can do this beforehand, or cautiously pick them out as you dig at it after cooking). The small amount of time pays off. If you have never heard of bangus, don’t worry. The common name for it is Milkfish. What is great about this is that it holds the flavor of the marinade, does not take very long to pan fry, and it is a great, white and firm meat. You can find bangus, most likely, in your local Asian market, and typically frozen. Start by marinating your fish. To a sealable plastic bag, or medium sized bowl, add the vinegar, garlic, black peppercorns, and salt and mix to combine. Add the bangus (in my case they came portioned, most likely quartered). Give a good mix, seal or cover, and let everything marry overnight. The following morning, remove the bangus, and place onto a plate. Pat both sides with paper towel and remove any peppercorns or garlic from the fish. Don’t worry if some stick on the fish. That’s extra flavor in my opinion! Get a large skillet ready, and add in your oil. Bring this to a medium-high heat. After a few minutes of warming the oil, lay in the filets, skin side down, and cook for about 4 minutes or until the skin is nice and crispy. Once the skin is crispy, gently flip it over and cook an additional 4 minutes. During this time, feel free to plate your cooked jasmine rice, cook your eggs, and plate that, and get ready to feast. Once the fish is cooked, remove with a slotted spatula, preferably a fish spatula, and place on a paper towel lined plate to remove any excess oil. Remove the filets from the plate and onto your plate along with the rice and eggs, and dig in. I loved this dish. Not only the flavor of the vinegar, garlic, and peppercorns but when that fish is mixed with the rice and eggs, well you have one heck of a breakfast! If you cannot find the bangus, feel free to try the marinade on another firm whitefish. Hope you enjoy! The fish takes a bit of preparation but nothing out of the ordinary. A simple marinade, preferably overnight, along with the removal of any bones (you can do this beforehand, or cautiously pick them out as you dig at it after cooking). The small amount of time pays off. If you have never heard of bangus, don't worry. The common name for it is Milkfish. What is great about this is that it holds the flavor of the marinade, does not take very long to pan fry, and it is a great, white and firm meat. 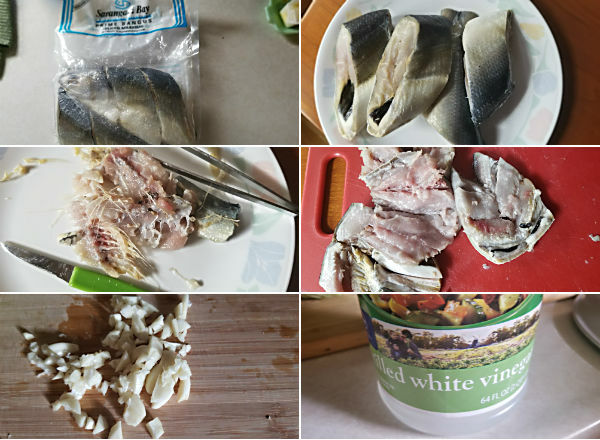 You can find bangus, most likely, in your local Asian market, and typically frozen. The following morning, remove the bangus, and place onto a plate. Pat both sides with paper towel and remove any peppercorns or garlic from the fish. Don't worry if some stick on the fish. That's extra flavor in my opinion! Thanks so much for sharing these delicious recipes! I definitely plan and look forward to making both of them for my family! We are all avid corn lovers, so I am very confident that these yummy recipes will be a big hit!